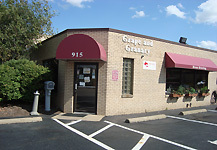 The Grape and Granary is a family-operated business which is dedicated to serving your home beer brewing and winemaking needs. We are wine and beer enthusiasts and consumers of our own products. 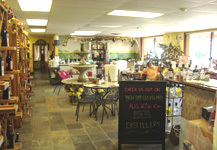 We are also a winery, wine-on-premise (make wine at our store) and a distillery (Renaissance Artisan Distillers). Our customer service staff is composed of John, Mike, Nick and Tristah. Mary and Marquita head up our Winery. Ron is our head distiller. John brewed his first batch of beer in 1987 while a college student. Since that time he has become a beer and wine devotee. He regularly brews 5-10 gallon extract and all-grain batches of beer. He is a Nationally ranked beer judge in the Beer Judge Certification Program and conducts beer and wine making classes. He is also an avid winemaker and loves big California reds. He regularly makes wine from kits, fresh California juice and frozen California grapes. In spring of 2004, he won a gold medal for his Central Valley, California Cabernet Sauvignon at the HWBTA wine competition held in Woodland Hills California. In 2008 and 2009, he won a gold and silver in the HWBTA national wine compitition. In 2009, he took three third place medals and one second place medal in the AHA national homebrew compitition in the Eastern Region. He is currently working on a Napa county Cabernet Sauvignon and an Italian style Super Tuscan (Sangiovese and Cabernet Sauvignon) and working with California grown Amador county grapes. Mary runs our winery and wine-on-premise operation. Mary is a ice wine enthusiast and is available to assist in wine-on-premise wine making and tasting. Marquita and Mary love to assist in making wine for weddings and other events. It is our goal to serve you in a most efficient and courteous manner. 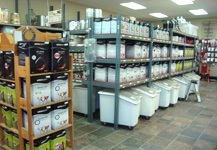 We are full-time staff and thus can stay quite knowledgeable about our products. We should be able to answer most any question. Should you have a problem or question please do not hesitate to call us at 800-695-9870 and speak to one of our knowledgeable staff (10 am to 7:00 pm EST weekdays). If you have any comments or information that you believe might help us serve you better or information about what works or fails to work, please contact us or send us E-mail.